An 'Input/Output' construct can be added to a 'Physical I/O Diagram' via drag-and-drop. 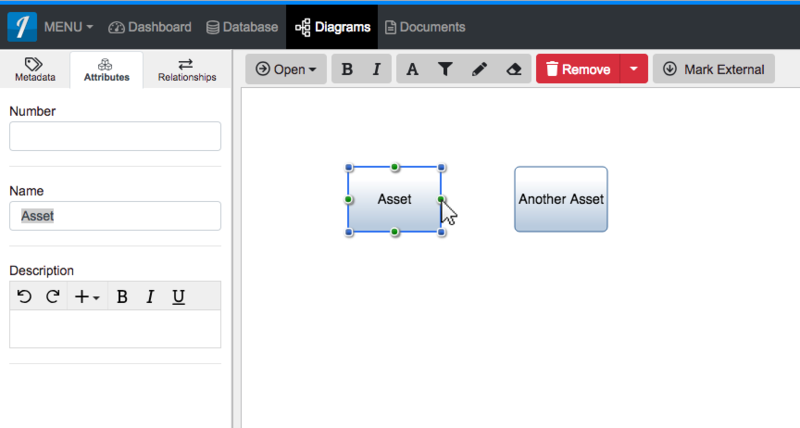 The example used on this page connects two 'Asset' constructs with an 'Input/Output' construct. Click one of the green circles on the selected 'Asset' and continue to hold down the left mouse button. Drag the green circle over to another 'Asset' of your choice. When the other 'Asset' box highlights green, release the left mouse button to drop the new 'Input/Output' and add it to the diagram. This opens the 'New Input/Output Creation' dialog. You will be asked to select the 'Conduit,' 'Asset's Action,' and 'Another Asset's Action' using drop-down menus. 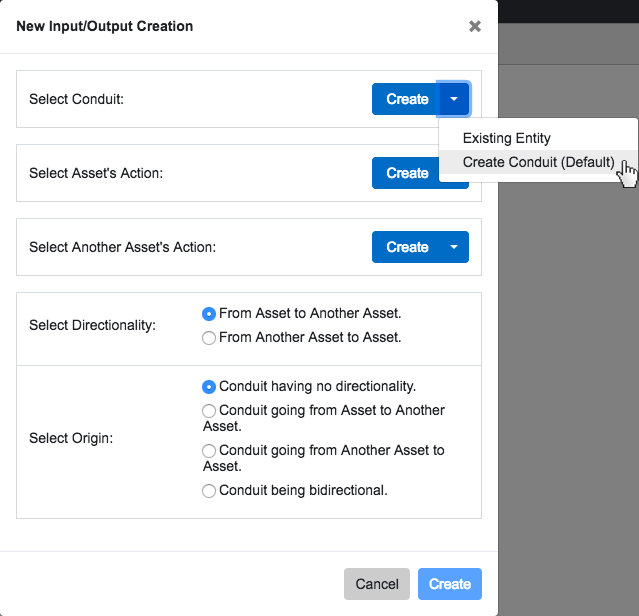 Next to 'Select Conduit,' click the blue 'Create' button (for the default action of creating a new conduit), or click the drop-down arrow to select an 'Existing Entity' or the 'Create Conduit' (default action). Depending on your previous choice, either select your 'Existing Entity' or give your new 'Conduit' a 'Name' and fill in any other meaningful details. Click the green check-mark button to save your selection. Click the blue 'Create' button at the button of the dialog to create your new 'Input/Output' construct. Once added to the diagram, notice the 'Input/Output' stays selected once it has been dropped. Since it is selected, the toolbar changes to include buttons for functions which can be used on the construct. The sidebar also changes to include additional 'Metadata,' 'Attributes' and 'Relationships' tabs. 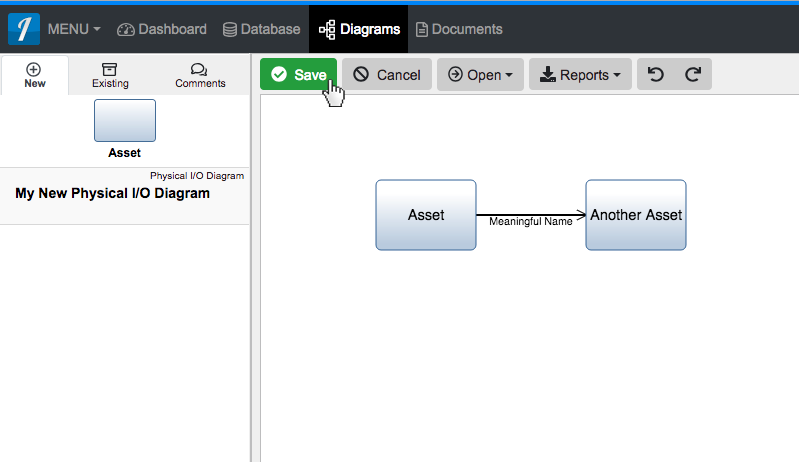 Enter a meaningful 'Name' for your new 'Input/Output' via the 'Attributes' tab of the left sidebar (focused automatically for convenience). * Note: For more information on this construct and how it is represented in the database model, see Physical I/O Diagram Constructs. 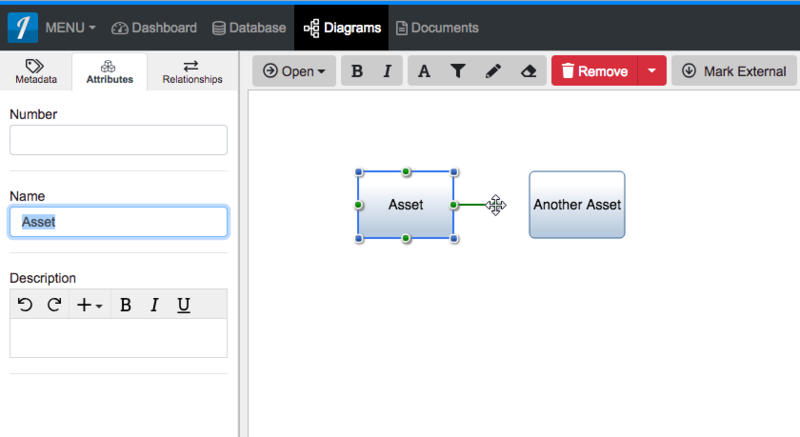 An ‘Input/Output’ construct can be added to a ‘Physical I/O Diagram’ via drag-and-drop. 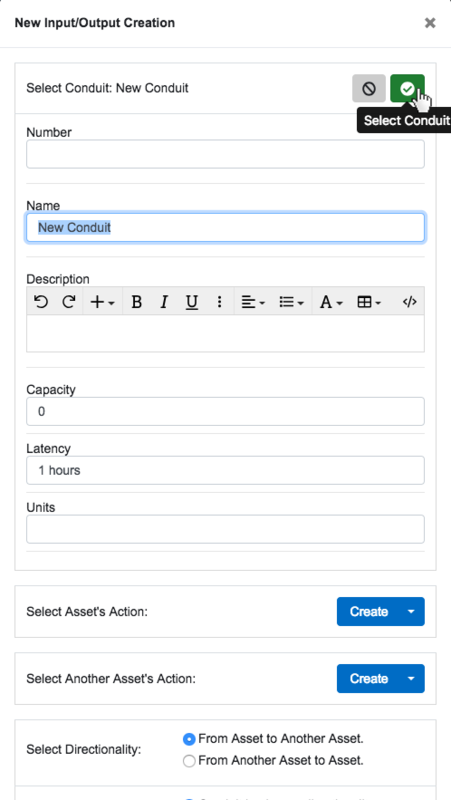 The example used on this page connects two ‘Asset’ constructs with an ‘Input/Output’ construct. Click one of the green circles on the selected ‘Asset’ and continue to hold down the left mouse button. Drag the green circle over to another ‘Asset’ of your choice. 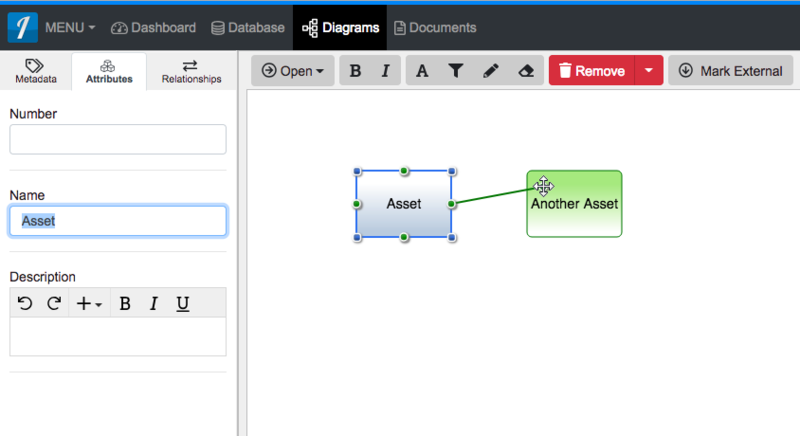 When the other ‘Asset’ box highlights green, release the left mouse button to drop the new ‘Input/Output’ and add it to the diagram. This opens the ‘New Input/Output Creation’ dialog. 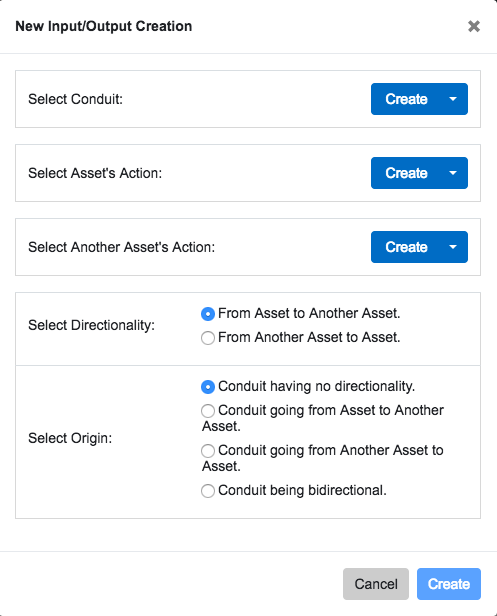 You will be asked to select the ‘Conduit,’ ‘Asset’s Action,’ and ‘Another Asset’s Action’ using drop-down menus. 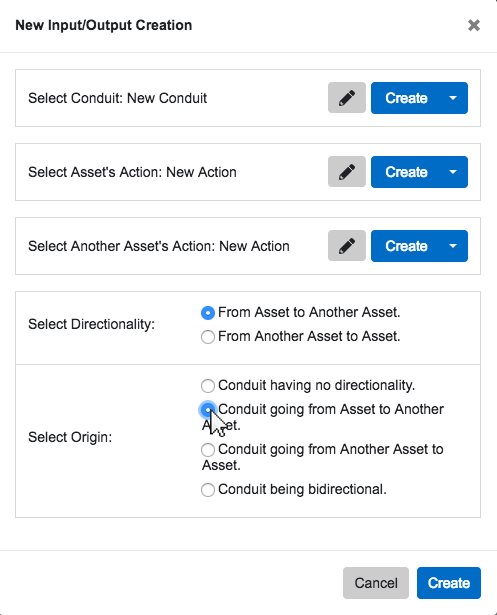 Next to ‘Select Conduit,’ click the blue ‘Create’ button (for the default action of creating a new conduit), or click the drop-down arrow to select an ‘Existing Entity’ or the ‘Create Conduit’ (default action). Depending on your previous choice, either select your ‘Existing Entity’ or give your new ‘Conduit’ a ‘Name’ and fill in any other meaningful details. Click the green check-mark button to save your selection. Click the blue ‘Create’ button at the button of the dialog to create your new ‘Input/Output’ construct. Once added to the diagram, notice the ‘Input/Output’ stays selected once it has been dropped. 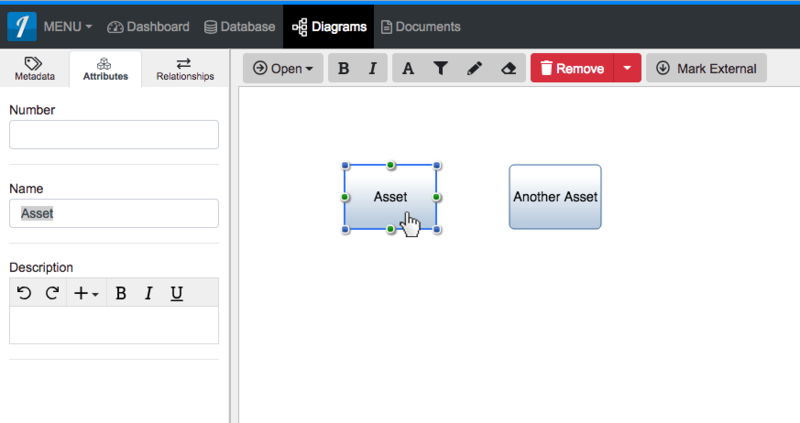 Since it is selected, the toolbar changes to include buttons for functions which can be used on the construct. The sidebar also changes to include additional ‘Metadata,’ ‘Attributes’ and ‘Relationships’ tabs. 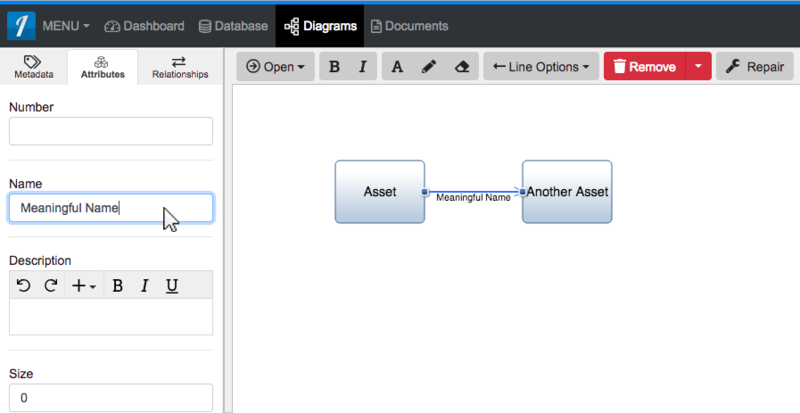 Enter a meaningful ‘Name’ for your new ‘Input/Output’ via the ‘Attributes’ tab of the left sidebar (focused automatically for convenience).